A little while ago, I read on a friend's Facebook page of Kintsugi, the Japanese art of repairing broken ceramics with gold. I thought it was truly fascinating as a concept, and also as a metaphor. 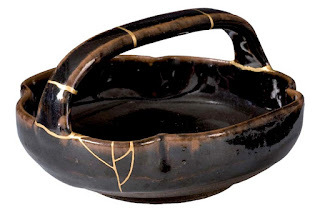 According to the Wikipedia entry for Kintsugi, this skill of making a new and beautiful object out of a broken and probably worthless and useless vessel came about because the late 15th century shogun Ashikaga Yoshimaga sent a damaged Chinese tea vessel back to China to be repaired. The resultant repairs, with ugly metal staples, were so shocking that the Japanese began to seek better ways to repair broken ceramics. 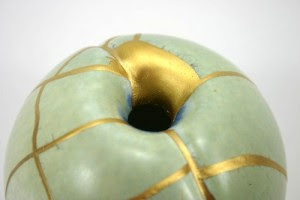 Firing lacquer resin sprinkled with gold dust as infill, Japanese created this new art form of kintsugi, an art that became so popular that purportedly, people deliberately broke important ceramics simply to enhance them with Kintsugi. Apparently silver was also sometimes used in the lacquer resins. 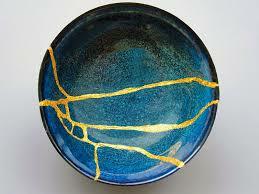 kintsugi seems to be very relevant as a philosophy and example of ways of repairing and recycling objects. I also feel that kintsugi is a wonderful metaphor for dealing with daily life. If disaster or adversity strikes, how can each of us use the equivalent of gold dust to repair the cracks in life, at least to some degree, and create something new and viable, if not beautiful, out of what has happened. In other words, how can we turn a negative into a transformed but luminous positive?